Cyndy Rider is a full-time paramedic with Lifenet, Inc. in Texarkana, Arkansas. As a child, she split her time between her home in Texarkana and the family farm in Garland City, Arkansas where her father was a farmer and member of the volunteer fire department. After graduating from Arkansas High, she attended Southern Arkansas University in Magnolia where she earned a Bachelor of Science degree in Interdisciplinary Studies and Mass Communication. In 2011 she moved to Providence Village, Texas with her husband, Thomas Rider. 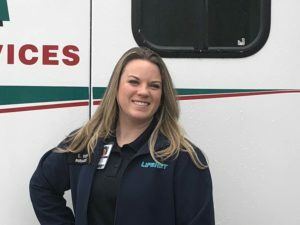 While living in North Dallas, she felt a strong desire to leave the retail industry after more 10 years and pursue a childhood dream of becoming a paramedic/first responder. In 2013 she completed her EMT training at UT Southwestern and began working for Allegiance Ambulance in Carrollton, TX. In 2015 she returned to school to become a Licensed Paramedic. She moved back to Texarkana and began working at Lifenet the following year. Cyndy thoroughly enjoys working with students as a preceptor. She takes great pride in teaching others, not only the skills necessary to become a confident and proficient paramedic, but also how to maintain a positive attitude in stressful and sometimes difficult circumstances. She is grateful for the opportunity this job has given her to have a meaningful impact on the lives of her patients and fellow employees. In her spare time Cyndy enjoys camping, traveling, spending time with her four dogs, playing piano, and serving the members of Fairview United Methodist Church.